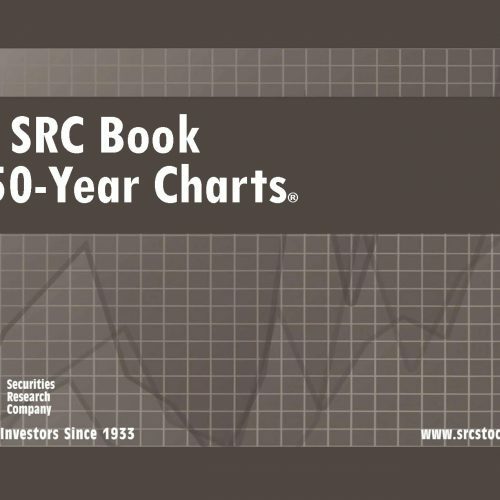 The 2019 annual print edition of the SRC Green Book covers over 1,100 sectors, industries and companies – with each chart is on its own 8.5″ x 11″ (full-size) page. Plus full online access to SRC Long-Term Chart Service spanning 25 to 50 years – giving you the longest fundamental stock performance. 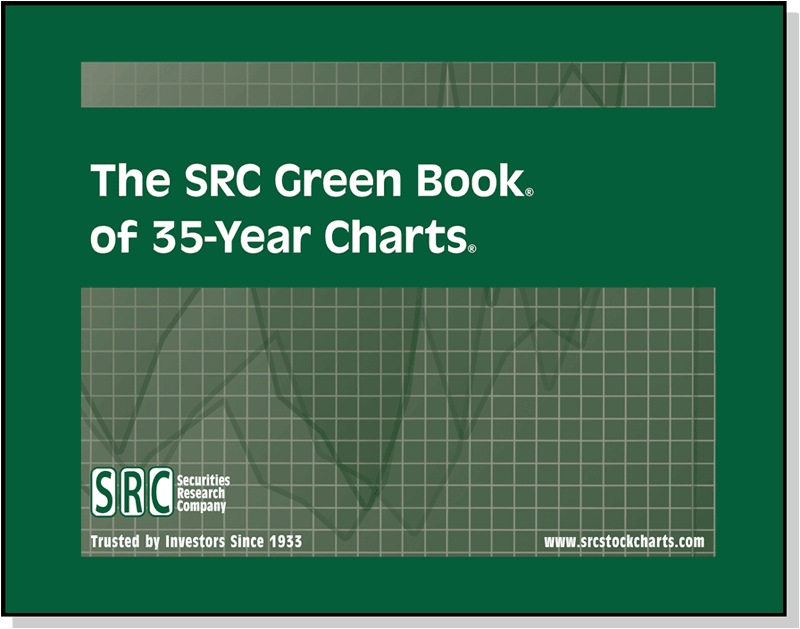 The 2019 annual print edition of the SRC Green Book covers over 1,100 sectors, industries and companies – with each chart is on its own 8.5″ x 11″ (full-size) page. Each chart provides a clear view of fundamental performance including: price, earnings & dividend growth since 1984. See how each stock fared through the last five recession and expansion periods. The online service starts with your purchase. The 2019 print edition ships early March 2019. To view the 25-Year DJIA Charts click here. To view the 35-Year DJIA Charts click here. To view the 50-Year DJIA Charts click here. With ChartScreen, all charts are updated each day, plus you can use ChartScreen’s powerful search & screening features to help you quickly find the stocks that fit your investing criteria. You can also create up to 50 portfolios. Best of all, each online chart is full-color and presentation-quality! Each long-term stock chart graphically traces the monthly price ranges, relative-to-market performance, 48-month moving average, trading volumes, plus earnings and dividends. In addition, all data has been fully adjusted for stock splits and dividends. Key events in the company’s history are noted. Recessionary periods are shaded grey. Capitalization figures shown at the bottom of each chart are based upon the company’s latest annual report. Monthly Price Ranges are read from the right scale. They represent the highest and lowest point reached. The horizontal cross bar indicated the last trade or closing price. Adjusted Earnings are read from the left scale and have extraordinary items removed such as discontinued operations, restructuring charge tax benefit, non-recurring charges, investment gains & losses, giving you the clearest earnings performance possible. Dividends are read from the left scale and are plotted on an annual basis. Dividends above or below the charts as well as specials, extras, irregular payments, etc. are noted. Relative Performance Line is read from the right scale. This line indicates whether the stock is outperforming, lagging or keeping pace with the general market as represented by the S&P 500. The Moving Average is plotted monthly and read from the right scale. This represents the average of the closing prices for the most recent 48 month period. Volume is plotted on an arithmetic scale at the bottom of each chart. The vertical bars indicate the number of shares traded each month. Thousands are indicated by a T at the top right of the volume scale, millions by an M and billions by a B. Growth Performance Measurement (GPM) is being provided in a block that appears in the top left corner of the company chart. The percent gain or loss for price, earnings, and dividends is shown for specific time periods as indicated by the number of years shown. The figures presented are average annual compounded percent return. Key Notations – Significant events in a company’s history, such as an acquisition, divestiture or stock split are indicated on the chart. Semi-logarithmic scale – Our stock charts are plotted on uniform semi-log grids. This enables you to quickly compare percentage moves on one stock chart with any other.